The city says complaints about trash and hazards around homeless encampments are leading to expanded clean-up operations. Homeless advocates see the efforts as something else: criminalization of homelessness. Mayor Kevin Faulconer says his focus is on connecting the homeless with housing rather than booting them from downtown. Early Tuesday, city workers packed into two garbage trucks and a handful of city vehicles and headed to a homeless encampment in East Village. For the second time in eight days, city and Urban Corps workers picked up trash on a dusty strip along 17th Street. They looked for hazards and picked up unattended items. Police officers and some of the homeless looked on. City workers had taped bright green notices in the area late last week, following the same practice they have for years. But the scope of sweeps like this one have grown. As the neighborhood developments and tent cities swell, so too have city efforts to clean up litter, soiled clothing and human waste that can build up around homeless encampments. The sweeps are now covering larger areas downtown. City officials say complaints have soared, resulting in larger clean-up operations that span more city blocks. An official who oversees the clean-up efforts says the increased coverage isn’t an organized effort to clear the homeless from downtown but rather a response to the uptick in complaints and observations by city workers. The city workers doing it report to Mayor Kevin Faulconer, and he says he is focused on finding homes for those living on the streets and that the attention on the sweeps is a distraction. Last Friday, the green signs appeared on block after block in East Village warning of clean-up operations on Monday and Tuesday. City workers cleared some of the same areas last week, including immediately before an El Niño storm hit. Yet some of the homeless and those who advocate for them say the growing footprint of the operations can send a message that they’re not welcome in a gentrifying neighborhood. The city’s long conducted clean-up operations of homeless encampments. They’ve always been controversial. In 2009, the nonprofit Isaiah Project and the ACLU of San Diego and Imperial Counties sued the city and the Downtown San Diego Partnership, claiming workers had unlawfully seized and discarded the property of dozens of homeless San Diegans during clean-up operations. They also accused the city and the partnership of not providing proper notice of those operations. The city later reached a settlement deal that required it to provide at least three days’ notice and set up a city-run storage facility where unattended property can be held after clean-ups and. The clean-ups have continued with more stringent requirements that city workers set property aside for safekeeping and post the green signs to warn that they’re coming. Today the operations kick off with orders from police officers that the homeless who remain pack up and leave. Sometimes there are arrests, though police maintain they’re usually for violations unrelated to a person’s homelessness such as drug possession or a warrant. The process has become a regular drill for the homeless who live in East Village but some say they’re happening more often. 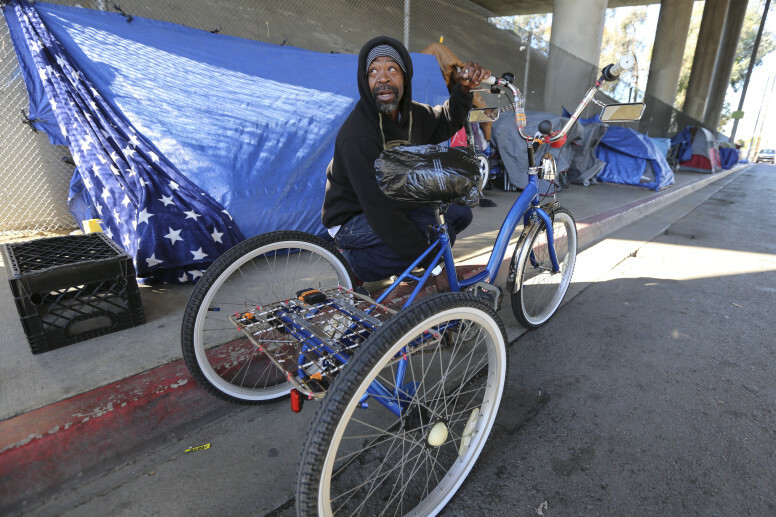 Steve Hillard, who lives underneath a bridge on Commercial Street, said the city’s stepped up the clean-ups and enforcement in the past year. City Councilman Todd Gloria, whose district includes East Village, said the city seeks a balanced approach with the clean-ups. Residents and business owners who report waste and hazards often expect immediate action. Gloria said he believes the clean-ups address those demands but give the homeless ample time and notice to move. “We’re the city and we’re responsible to all of our citizens, homeless or not, and we do get a great deal of complaints from folks who are witnessing these encampments and they raise concerns that do end up becoming public health issues that we have to go out there and control for,” he said. Faulconer was adamant his focus is on connecting the homeless with housing rather than booting them from downtown. Faulconer and Gloria separately expressed frustration with the attention the clean-up efforts have gotten recently. Both emphasized their belief that the focus should be on housing the homeless and noted the city’s throwing more resources at that goal through its new year-round shelter and a recently announced initiative to house 1,000 veterans. 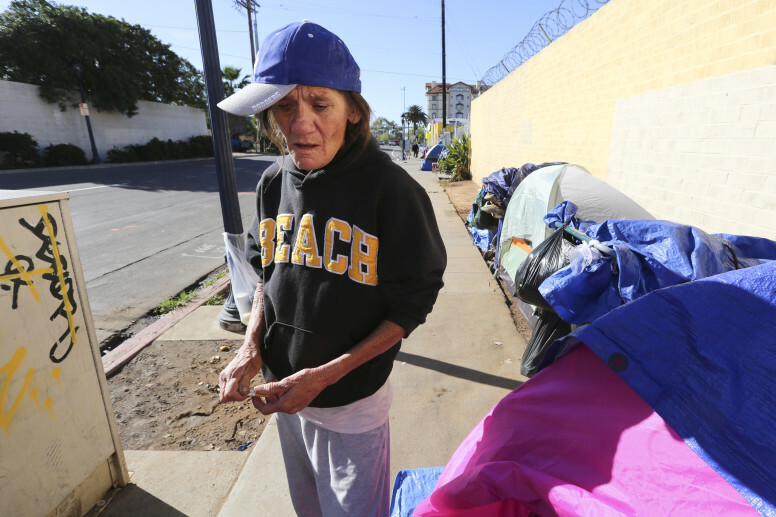 Then there’s the fact that homeless outreach officers offer open shelter beds to the homeless before and during every operation, Faulconer said. Monday’s clean-up operations shed light on the difficulty authorities face in doing that. Police Lt. Martha Sainz said officers interacted with 48 people during Monday’s operation. Only one accepted services. 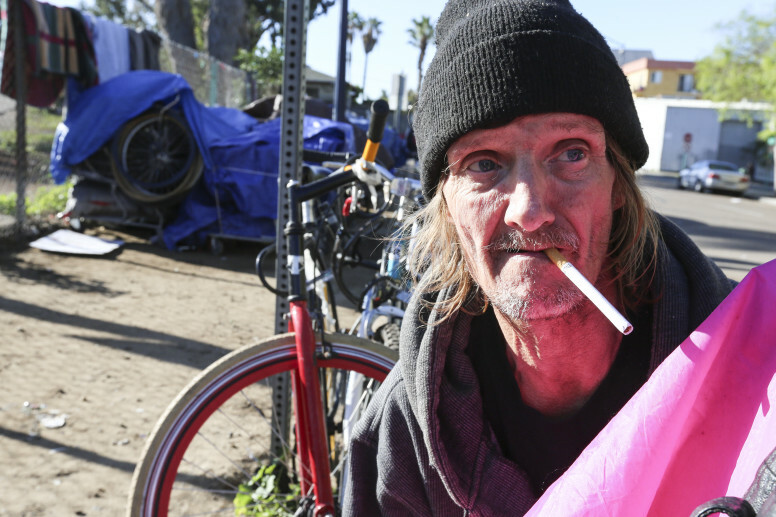 Advocates argue that statistic is more a reflection on San Diego’s approach to both clean-ups and its current shelter offerings than homeless folks’ disinterest in getting off the street. One of them is Michael McConnell, who sits on several local homeless committees and has documented recent clean-ups on social media. McConnell said he believes the property removal and clean-ups of encampments are necessary but the growing footprint and frequency of the city’s operations raise questions. He urged the city to schedule regular clean-ups to offer more predictability and tell the homeless where they can go when they’re under way rather than simply order them to leave. He’s convinced the current approach amounts to criminalization of homelessness, a tack that federal leaders discourage. “To me, it’s relatively obvious that it’s meant to displace people and not really to clean an area,” McConnell said. Scott Dreher, the attorney who sued the city in 2009 and negotiated the clean-up settlement, had a similar take. A handful of homeless East Village residents I’ve talked to in recent months have expressed similar views yet remain in the neighborhood. Gary Menteer chatted with me Tuesday as he watched city workers clear the patch on 17th Street and acknowledged he sometimes appreciates the clean-ups when debris and waste pile up. This wasn’t the first time I met the Marine veteran. I talked to Menteer last week days after a clean-up in the same area. He said often returns to the area hours after clean-ups by either city or state workers, who also regularly clear areas nearby. When workers do show up, Menteer said, the homeless can inadvertently lose belongings and receive criminal citations.